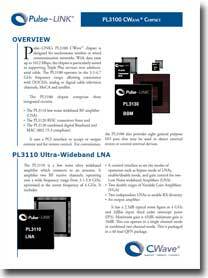 Carlsbad, CA, April 10, 2007 – Pulse~LINK, Inc., pioneer of Ultra Wideband (UWB) semiconductor solutions for whole-home HD networking, announced today that it is a Finalist for the Red Herring 100 Award. The prestigious award recognizes 100 private companies based in North America that play a leading role in innovation and technology. Pulse~LINK is the first semiconductor company to deliver a solution capable of true room-to-room networking of interactive High Definition content from a hybrid wired/wireless chipset. Devices enabled with Pulse~LINK’s CWave® UWB chipset allow HD content located anywhere in the home to be shared across the existing coax backbone with wireless connectivity in each room for Set-Top Boxes, HDTVs, DVRs, DVD players, Gaming Devices, Media Center PCs, and other multimedia equipment. CWave® enables High Definition content to be streamed throughout the home with IPTV functionality and provides End-to-End Quality of Service, while still preserving content protection mechanisms. Pulse~LINK, Inc. is a privately held Delaware Corporation headquartered in Carlsbad, California, with nearly 300 issued and pending patents pertaining to UWB wired and wireless communications technology. Pulse~LINK’s CWave® solution delivers up to Gigabit data rates over coax and wireless networks from the same chipset, providing consumers with the unprecedented ability to stream and distribute high quality multimedia content throughout the home. CWave® solutions support simultaneous operation of 1394, Gigabit Ethernet and HDMI over coax and wireless connections. For additional information about Pulse~LINK, Inc., please visit: http://www.pulselink.net.